Here, we describe an adult-onset LCH with rare, atypic, and very unusual cutaneous involvement. 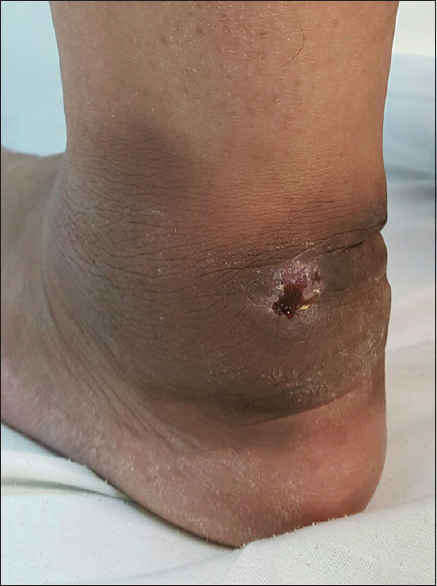 A 45-year-old female presented to dermatological consultation with a large ulcerative plaque in posterior side of left ankle for 2 months. She was a known case of hypothyroidism from 10 years ago, a known case of systemic lupus erythematosus (SLE) from 5 years ago and a known case of diabetes insipidus from 3 years ago. The patient was on levothyroxine (0.1 mg daily), prednisolone (5 mg daily), hydroxychloroquine (200 mg daily), and DDAVP (desmopressin acetate) Nasal Spray 1 puff q12 h.
Dermatologic examination revealed a single, well-defined ulcerative erythematous plaque in the posterior side of left ankle. On palpation, it was indurated without tenderness and discharge [Figure 1]. No lymphadenopathy or organomegaly was detected around the lesion. The patient did not complain of any pain or pruritus as well. As the patient was on prednisolone for the treatment of SLE for several years, she was initially diagnosed as having an infectious lesion and treated with antibiotics for 2 weeks without any improvement. At this stage, the patient was referred to our dermatology clinic for further evaluation. Smear and culture from ulcerative part of the lesion were done but the results were negative. 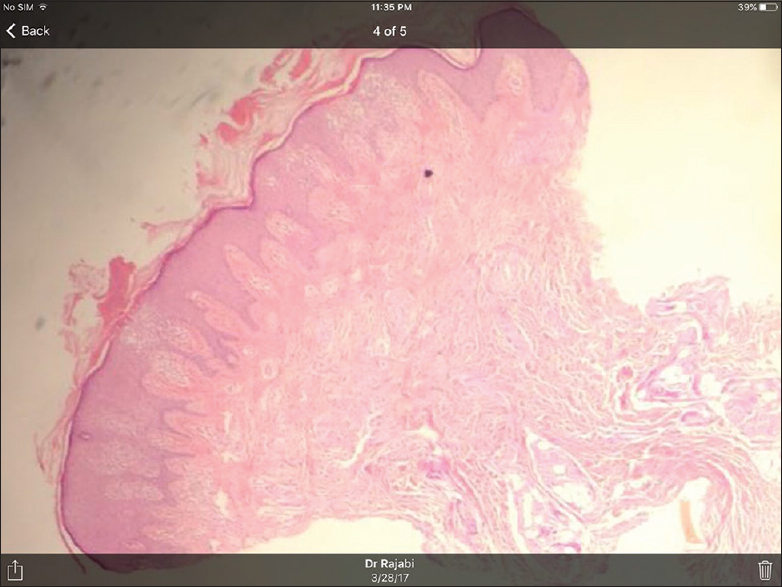 After that, skin biopsy of the infiltrated margin of the lesion was performed. 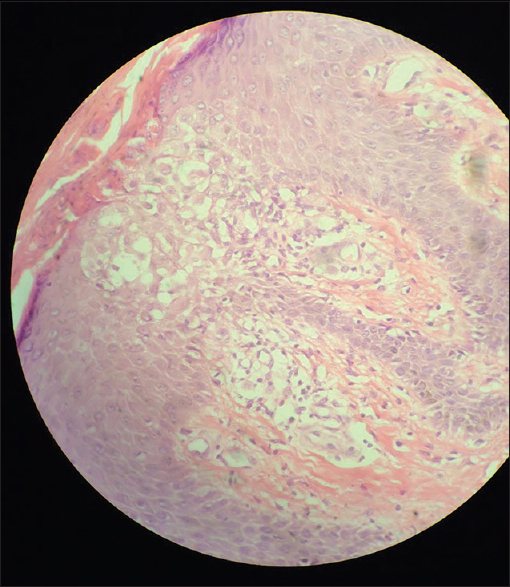 Sections showed focally, invasion of the epidermis by small aggregation of large ovoid cells with abundant eosinophilic cytoplasm. The nucleus was reniform and some was coffee-bean shape. Hence, the diagnosis of LCH was made based on morphologic findings in microscopic examination [Figure 2], [Figure 3], [Figure 4] and confirmed by immunohistochemical staining which revealed the aggregation of S100 and CD1apositive tumoral cells [Figure 5] and [Figure 6]. Hematologic examinations, liver, and renal function tests were within the normal range. Lipid profile showed mild hypercholestrolemia and mild hypertriglyceridemia. Serologic examinations revealed positive antinuclear antibody test and positive anti-double stranded DNA test. Right ankle radiography reported osteoporosis secondary to prolonged use of corticosteroids, fatty degeneration of bone marrow and slight osteochondral injury in tibiotalar joint, without any lytic bony lesions. Since LCH is a multisystem disease, complete staging and more evaluations such as skull series, chest radiography, abdominal computed tomography, and magnetic resonance imaging of the brain are necessary to decide on the initiation of effective systemic treatments, so the patient was referred to the oncologist for further work up but she did not come back for follow-up to our clinic. Skin lesions in LCH may resemble seborrhic dermatitis, especially behind the ears, in the axillary and inguinal folds. Oral manifestations include gingival bleeding and necrotic and ulcerative lesions over the gums. Atypical cutaneous presentations of LCH have been reported as isolated tonsillar involvement, paronychia, and purely cutaneous forms of LCH in elderly patients. About 70% of adults with LCH have multisystem involvement. Diabetes insipidus is the most common endocrine manifestation in LCH, and especially in adults, it is more frequent than children., In women with genital ulcer and diabetes insipidus, LCH is among the differential diagnosis. As we mentioned in case presentation part, our patient had multisystem LCH with the pituitary gland and cutaneous involvement. Cutaneous lesion in our case presented as a large infiltrated ulcerative plaque on left ankle. Presentation of cutaneous lesion on ankle in LCH is very rare and unusual. To the best of our knowledge, just one previous case study reported skin involvement in ankle area in an 81-year old man with generalized cutaneous LCH. This patient was much older than our patient and had generalized cutaneous LCH with multiple skin lesions in different areas besides ankles. Our case had only one plaque on left ankle which was large and ulcerated but in mentioned case study, the patient had multiple erythematous macules and plaques on his ankle. Our patient, a known case of hypothyroidism, SLE, and diabetes insipidus, was on levothyroxine, prednisolone, hydroxychloroquine, and DDAVP (desmopressin acetate) before developing cutaneous lesion on the ankle with diagnosis of LCH. As LCH is a multisystem disease and required complete evaluations of other organs, we decided to refer the patient to the oncologist for further work up, but she did not come back for follow-up to our clinic. We reported this case because of very unusual cutaneous presentation of LCH. Usually, cutaneous presentations of LCH in adults are generalized or seborrhea-like lesions but in this patient, it was single and presented in a very unusual site (ankle) and before developing such lesion, she had diabetes insipidus for several years due to the involvement of pituitary gland. Blazewicz I, Biernat W, Kowalczyk A, Baranska-Rybak W, Nowicki R, Stawczyk-Macieja M, et al. 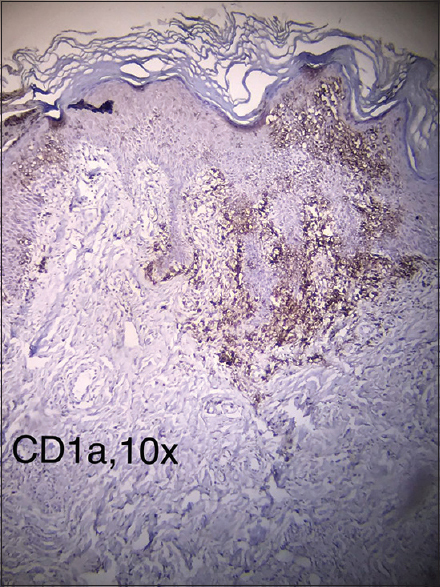 Adult onset of multisystem Langerhans cell histiocytosis with skin and lymph node involvement. Postepy Dermatol Alergol 2015;32:225-8. 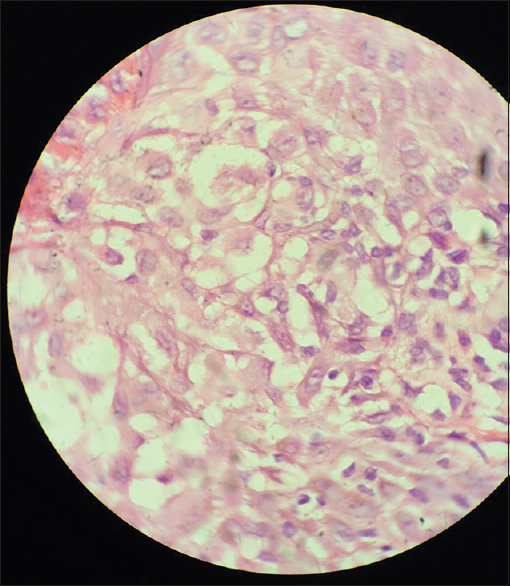 Jeunon T, Sousa MA, Santos-Rodrigues N, Lopes R. Langerhans cell histiocytosis - A case report. Dermatol Pract Concept 2012;2:25-9. Reddy IS, Gowrishankar S, Somani VK, Murthy DB. Adult onset Langerhans cell histiocytosis: Report of two patients. Indian J Dermatol Venereol Leprol 2014;80:560-2. Abla O, Egeler RM, Weitzman S. Langerhans cell histiocytosis: Current concepts and treatments. Cancer Treat Rev 2010;36:354-9. Lai JY, Tang MM, Priya G, Rajasuriar JS, Suganthi T. Langerhans Cell Histiocytosis in an Adult - a rare, life-threatening and not to be missed. Med J Malaysia 2014;69:95-7. Chai D, Tao Y, Bao Z, Yang L, Feng Z, Ma L, et al. The adverse prognostic hallmarks in identical twins with Langerhans cell histiocytosis: A clinical report and literature review. Tohoku J Exp Med 2013;230:219-25. Erdem H, Kadioglu N, Uzunlar AK, Yücel I, Oktay M, Besir FH. 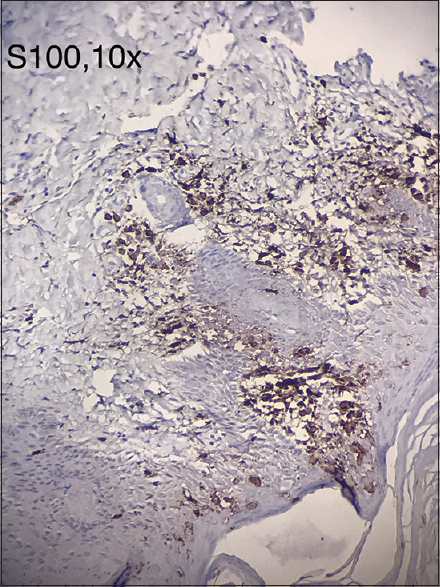 Langerhans cell histiocytosis mimicking osteomyelitis in an infant. APSP J Case Rep 2013;4:27. Azreen AB, Kwan CY, Prepagaren N. Langerhans cell histiocytosis of maxillary sinus. Med J Malaysia 2012;67:627-8. Stockschlaeder M, Sucker C. Adult Langerhans cell histiocytosis. Eur J Haematol 2006;76:363-8. Histiocyte Society 2009. Langerhans Cell Histiocytosis Evaluation and Treatment Guidelines. Histocyte Society Online; 2009. Available from: http://www.histiocytesociety.org/site/c.mqISL2PIJrH/b. 4442715/k.A339/Treatment_Plans.htm. [Last accessed on 2009 Apr]. Gadner H, Grois N, Arico M, Broadbent V, Ceci A, Jakobson A, et al. Arandomized trial of treatment for multisystem Langerhans' cell histiocytosis. J Pediatr 2001;138:728-34. Sun WG, Zhong LS, Chen H. A case of adult generalized cutaneous langerhans cell histiocytosis. Ann Dermatol 2016;28:262-4. Liu YH, Fan XH, Fang K. Langerhans' cell histiocytosis with multisystem involvement in an adult. Clin Exp Dermatol 2007;32:765-8. Wong LS. An unusual case of neonatal langehrans cell histiocytosis presenting with diffuse hemorrhagic nodules and a cutaneous abdominal mass. Indian J Dermatol 2015;60:424.